LAFAYETTE- Interstate 10 east is closed at the I-49 interchange after a multi vehicle crash. 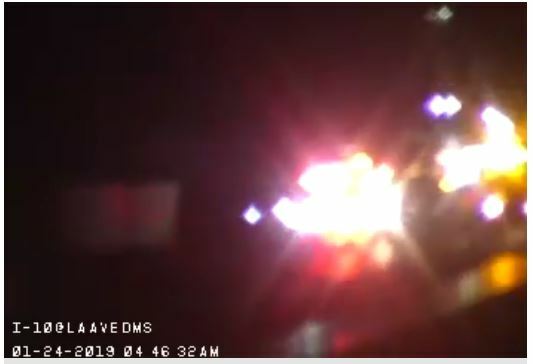 It happened just before 2 A.M. at mile marker 106 just past the Louisiana Avenue exit. According to State Police, five vehicles were involved including an 18-wheeler. At least one vehicle was on fire. Two people are confirmed dead and there are reports of other injuries but the nature of those injuries is unknown at this time. Troopers are on scene investigating and they expect the closure to continue over the next few hours. Eastbound traffic has been routed to I-49 north and 190 east. We’ll continue to update you throughout the morning on when the interstate will re-open.